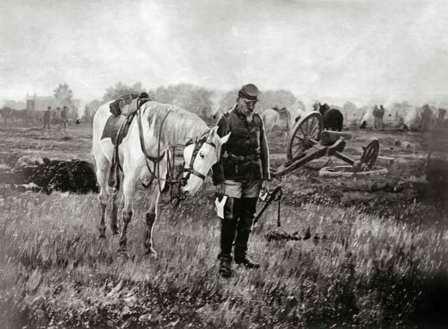 William T. Trego | Catalogue Raisonné | Melancholy Cavalryman and His Horse on the Battlefield, n. d.
Melancholy Cavalryman and His Horse on the Battlefield, n. d.
Location unknown. It is presumed lost. This work is known only by a poor quality black-and-white photograph printed on thin paper found in the William Trego reference file in the library of the Pennsylvania Academy of the Fine Arts in Philadelphia. It is one of four such photographs in the file, but none provides identification, date, or other information. However, as the other three paintings are known, it is possible to approximate the date of this untitled work. All four paintings appear to have been photographed on the easel in Trego’s studio, and the dimensions of this work have been calculated from that fact. These photographs may have been among the group of photographs sent by Trego to Harrison Morris at PAFA in September 1900 when Morris was attempting to help Trego get a job as an illustrator. The cavalryman holds a letter in his hand. Whatever bad news he has received, his horse seems to understand and sympathize. It is a striking example of Trego’s tendency to use animals, especially horses, to express sentiments important to the understanding of the content of his paintings. In this case he comes close to Victorian sentimentalism. There exist two charcoal sketches with very similar themes, the Cavalryman, at the Mercer Museum and the Melancholy Soldier with Letter, in a private collection, which may be related in some way to this lost painting, though neither of those works includes a horse. These three works are in striking contrast to the vigorous activity Trego usually painted when portraying military subjects.